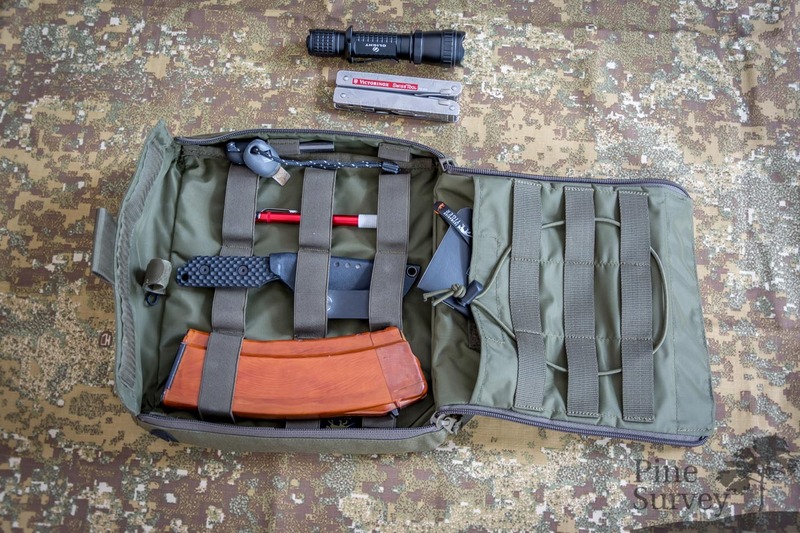 the Tasmanian Tiger Operator Pouch. 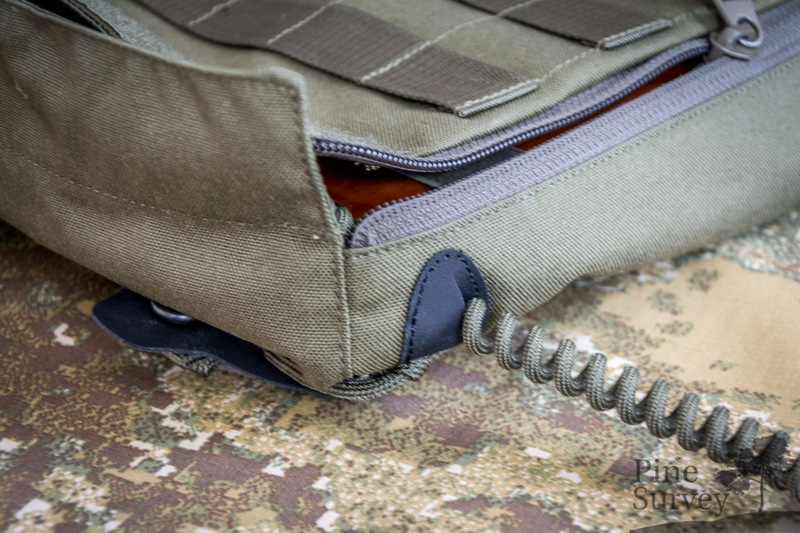 This pouch is a very specialized and MOLLE compatible pouch with a quick release feature, mainly designed for plate carriers and similar systems. What struck me the most was the general size of the pouch. It already looks big on the pictures, but it is even more bigger in real life. 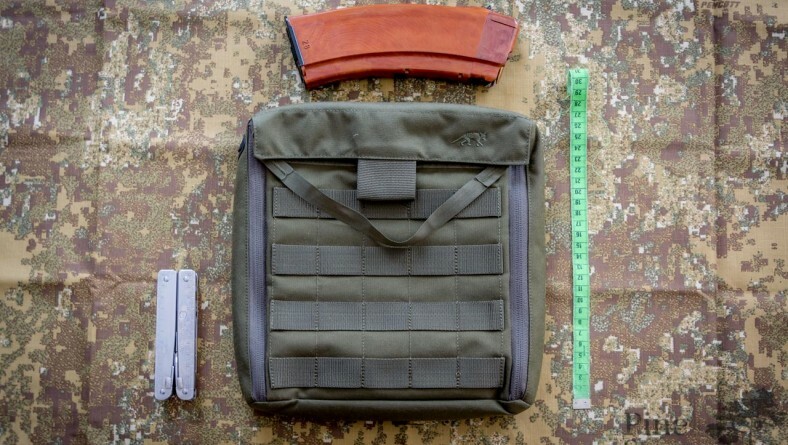 To give you an idea I have taken a picture with a Multitool, an AK-74 mag and a measuring tape. 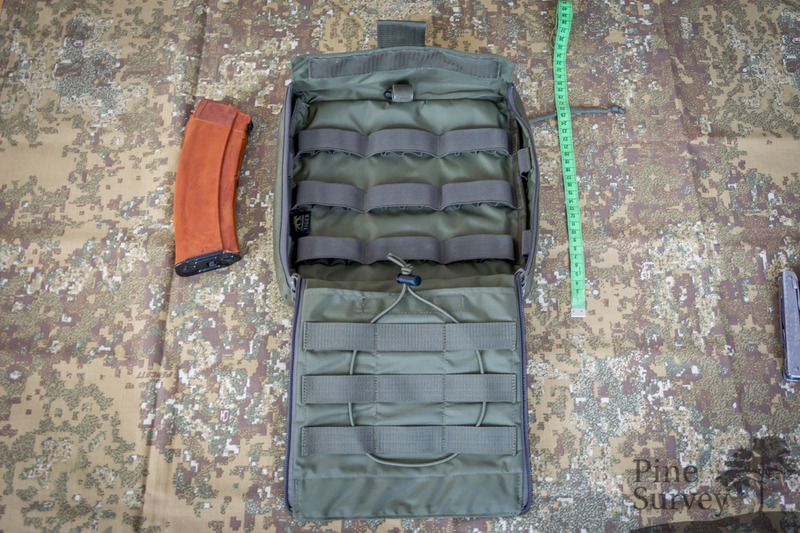 As you can see on the picture, the front features four rows of MOLLE straps with five channels each. 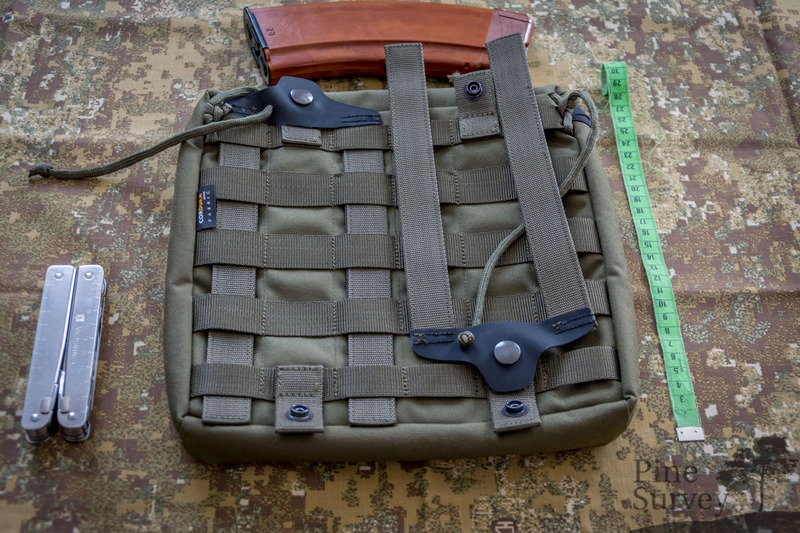 So there is still room for another small MOLLE pouch or panel or just pens, chemlights and such. Opening the pouch is done by first pulling up a velcro flap and then pulling down a strap that is connected to both zippers on the left and right. The pouch is a full clamshell design, but we will come to that later. 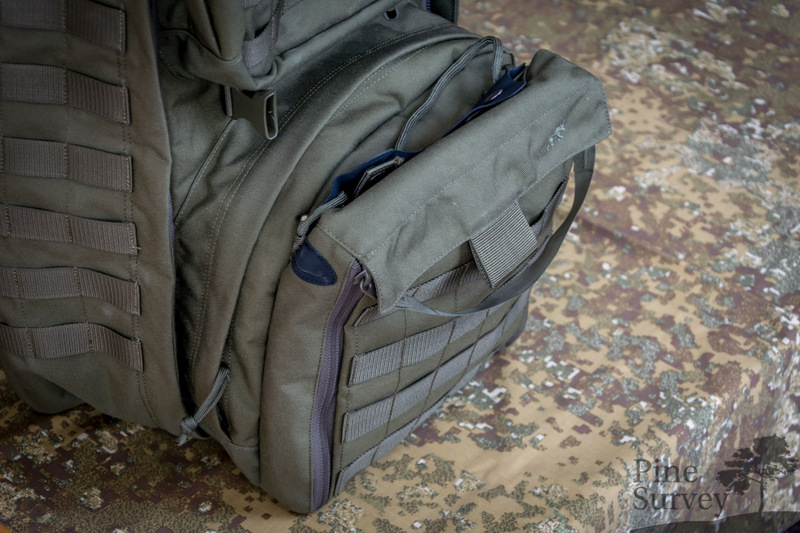 The back features five rows of MOLLE straps with six channels each. 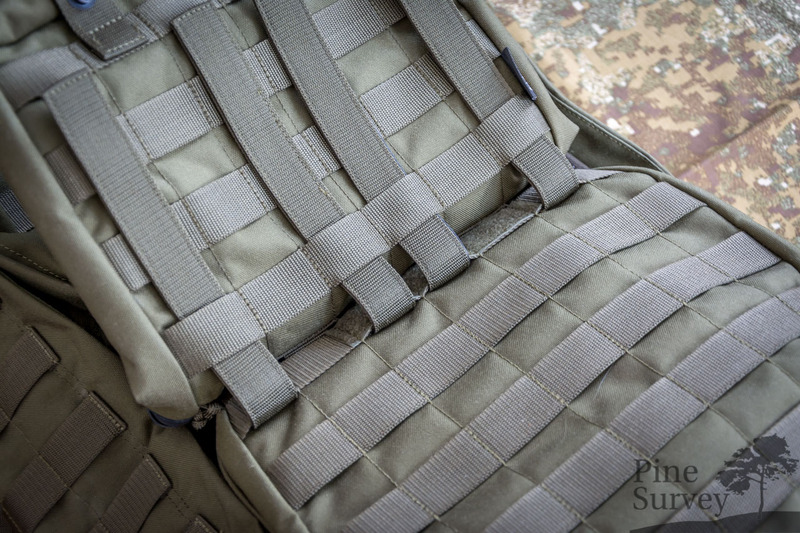 The first and last strap is a little bit slimmer because on top of them are straps with the button locks for the quick release system, and because these are put on top of the opposing MOLLE webbing that the pouch is mounted on. 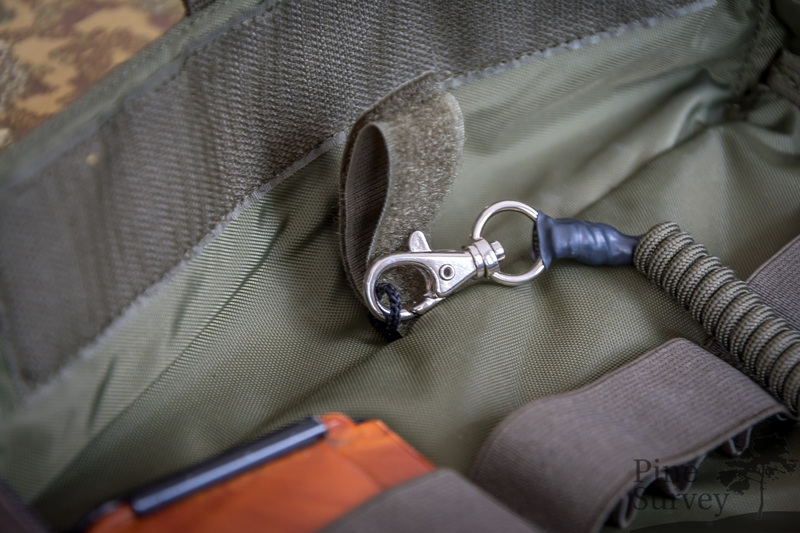 The quick release system consists of two pairs of doubled straps that are connected through a Hypalon tab that can be fastened to the pouch via the button locks. 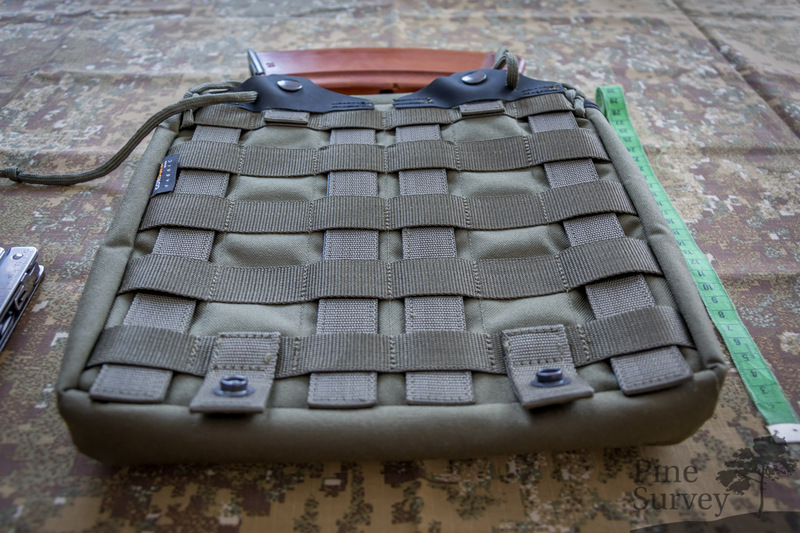 The straps are used like any other MOLLE system with the exception that they are not fixed at the bottom. That way you can just pull them out and detach the pouch in a fast matter. Since there are button locks at the top and the bottom you can choose for yourself on how to use the system: by pulling the straps out from above or below. 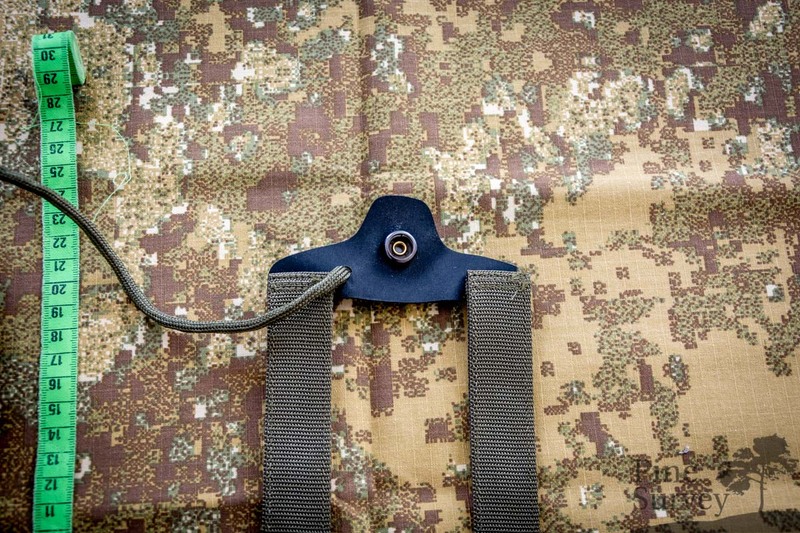 A simple paracord keeps the straps from getting lost. If you don’t need that, you can simply detach it. Let’s get to the interior of the pouch. As mentioned before it opens like a clamshell to provide full access to the material stored inside. The pouch features alot of organizational options through different elastic loops. At the rear side you will find three rows of elastic webbing with three large elastic loops each. Underneath each of these large loops you will find another four small ones. That gives you nine large and 36 small loops in total. At first I didn’t miss them, but now I wish Tasmanian Tiger would have incorporated some medium sized loops and not only small and big ones. That way you would have been able to secure bigger items like flashligts into the pouch. There are also two rows with two small elastic loops on each inner side as well. In the picture you will see different items put into the pouch to give you an idea about the size and arrangement of the loops. Of course it is up to you what you will put inside the pouch. 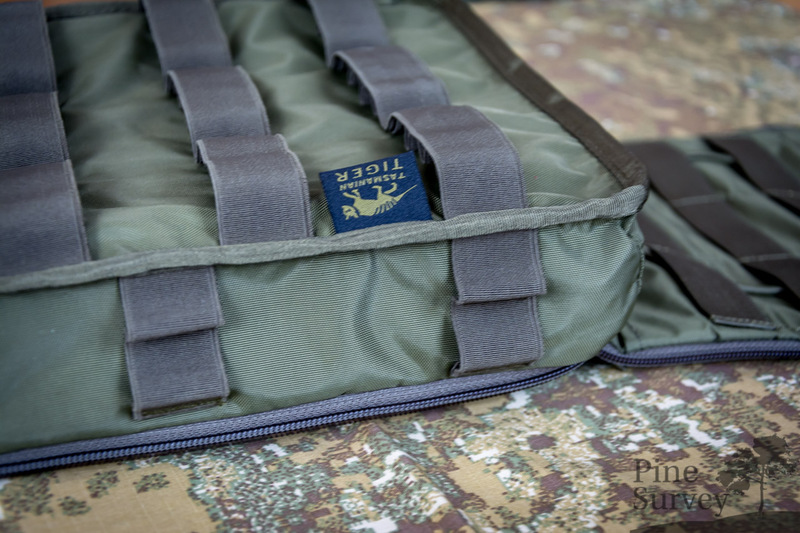 At the top of the compartment there is a velcro strap and a small cord loop to hang additional items into the pouch. There is also an opening at the side which allows cables or tubes to pass through. The front side of the interior (or better said the back of the opening flap) has a panel in it that can be closed via a velcro tab. It has a reversed flap so that nothing falls out when the pouch is being opened and the front side of the pouch is turned upside down in the process. There are also three rows of PALS webbing with three channels. A shock cord with a cord lock gives you the possibility to secure additional items. As with all Tasmanian Tiger products, the manufacture is top notch. The materials used are the highest grade and the workmanship is clean and without flaws. The seams are straight, there are no loose threads and the seams are finished with elastic binding. Tasmanian Tiger uses its own zippers, but those are as easy going as YKK. The zippers are sewn in reversed to stop dirt from getting inside the teeth. The pouch looks like it was the product of a very special inquiry. At least that is the opinion of a friend of mine, who has more insights into the matter. 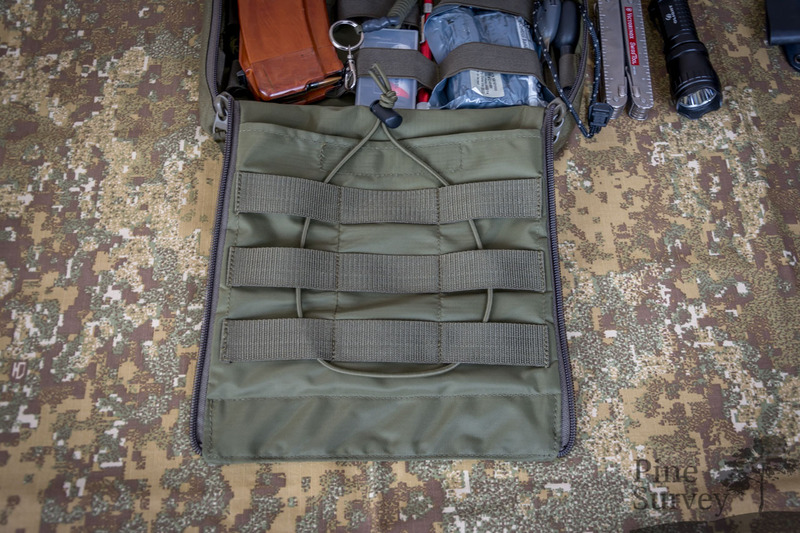 It takes alot of place on a MOLLE area and I can only guess the real functionality. It gives you enough room to organize dedicated items however. 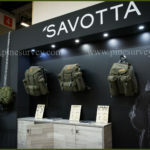 A advanced IFAK pouch comes to mind or even a backup medic pouch carried on the back of regular soldiers. I don’t want to speculate on that matter – the people who will make good use of this pouch will see its potential and don’t need me to tell them what it will do. Hopefully though, I was able to give a better impression of the specs and the numerous possibilities. Tasmanian Tiger offers a full range of dedicated pouches with very specific tasks. The operator pouch is a very good example for this. 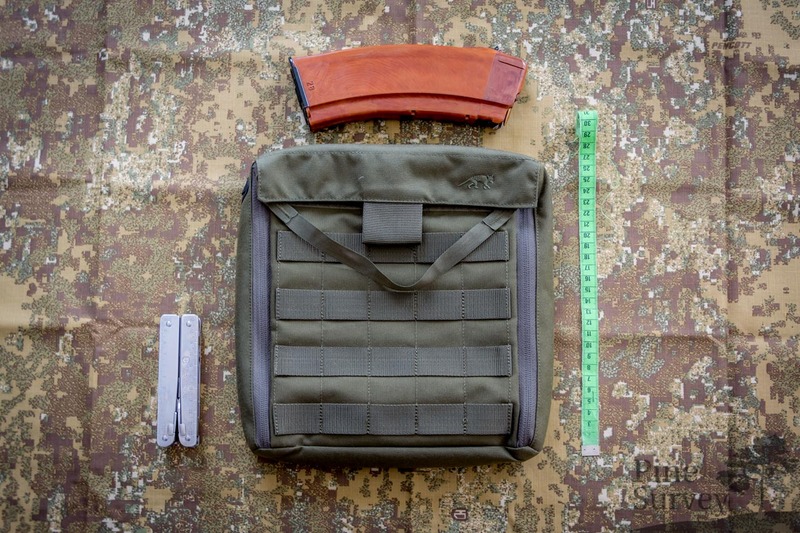 As soon as I have the opportunity, I will add pictures of the pouch on a plate carrier. Until then I hope this small review was enough to give you an idea! 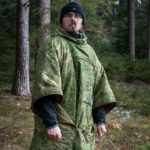 PreviousReview: Survivaltech Fanny Bag Mod.02	NextTasmanian Tiger launches new website!